Most quick links on the market today are imported, and they work fine for common, light-duty applications. But many climbers need rated, tested and high-quality quick links they can rely on. Well, that's what you get with these quick links from Maillon Rapide. 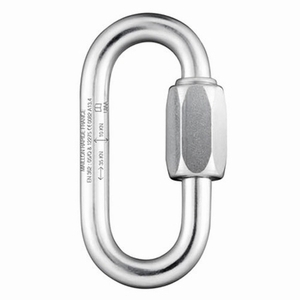 All of the quick links on this page are PPE Rated for climbing, mountaineering and industrial uses. We offer three styles: oval, pear and delta. The traditional oval shape is the most common, as its shape was developed on the principle of a chain link fitted with manual nut opening--this reflects the spirit of Maillon Rapide quick link connectors. The pear link option, available in two sizes, is fitted with the same nut opening as large opening quick links--its curved shape allows for smooth connection of several parts together. The delta links are best used with webbing, as the wide, flat design allows for maximum surface area contact and proper loading. Each link is marked with appropriate ratings for quick and easy identification in the field.